Shrimp-like animals of the family Talitridae and genus Orchestia sp. They are negatively phototrophic and feed only at night. Reside in damp macro-algae mats along shorelines and have gills for respiration Feed on decaying macro-algae which is the major food in their diet yet, they will feed on carrion. Sexual reproduction occurs within the damp algae mats or nests they construct on the sides of tanks along the surface. Females store fertilized eggs in brood chamber and a clutch of 50 to 750 eggs typical. Development is directly from the chamber and small amphipods mature in a matter of weeks under proper temperature and nutrition. 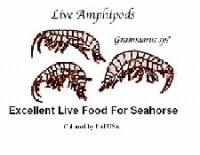 Excellent live food for many fish especially seahorses. 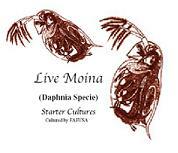 Florida Aqua Farms has developed a culture habitat which will allow you to raise small quantities of these animals. Starter culture can be used as a direct live food source or as an inoculant. If you are not going to culture amphipods, they will survive for 2 to 4 weeks in the refrigerator. See our Plankton Culture Manual for instructions.